If you’re looking where to buy cheese paper, Gator Paper is here for all of your cheese wrapping paper needs. With a NEW poly coating, our 1-ply Cheese Paper is the perfect cheese storage paper wrap for all types of cheese and is the best option on the market today! If you’re looking for the perfect substitute to Cheesecloth for storing your cheese once it reaches it’s final stage of creation, we have durable wax paper for cheese that is second to none that will definitely keep it fresh until use. Whether you own a cheese shop, grocery, or retail store, Gator Paper has you covered offering 1-ply Cheese Paper in standard & custom size sheets and rolls. If you are looking to take your store brand to the next level, then look no further than our custom printed Cheese Paper. No cheddar would taste better if it wasn’t wrapped in our printed Cheese Paper! I own a small cheese shop and can’t afford to order 25 cases of Cheese Paper at a time, what do I do? Don’t panic. The minimum order requirement for our custom printed Cheese Paper is a 3 case = 6,000 sheets, OR 3 rolls = 4,500 feet (1,500 feet per roll). Ordering in smaller quantities eliminates the need for lots of storage room. How can your lead time be 6-8 weeks when everyone else is 10-12 weeks? Because they are slow and inefficient! Our goal is to get your printed Cheese Paper order delivered as quickly as possible. We work tirelessly to make sure our customer deadlines are met and the quality of our product will keep you coming back for more. If you need your order in a hurry ask one of our sales team members about our Rush Order program. Standard Cheese Paper sheet size versus custom sheet size, how do I decide? All of our food service sheets can be cut to any custom sheet size needed. Whether you are wrapping cheese wedges or wheels, we can cut our paper to any size needed to get the job done. We also offer a standard sheet list that will help keep your overall project cost down. Cheese Paper can be printed with up to 2 spot PMS colors. Sometimes, screen of either existing PMS color can be made to add the look of a third or fourth color. This sheet can also be printed on the coated and/or uncoated side of the paper. We can match any PMS color on the chart. How creative can I get with my artwork? We’d like to think the sky is the limit, but unfortunately it’s not in this case. Short run food paper orders are limited to a basic step and repeat pattern of one or more logos or a full page pattern design that is step and repeated down the paper before cutting. Our talented art department will work closely with you to come up with a creative solution to any brand design challenge. 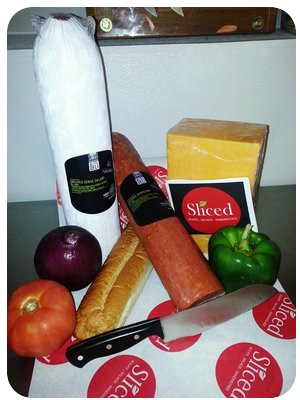 Need a price quote on custom printed Cheese Paper? Contact us today! Looking for the most versatile food service sheet on the market today? 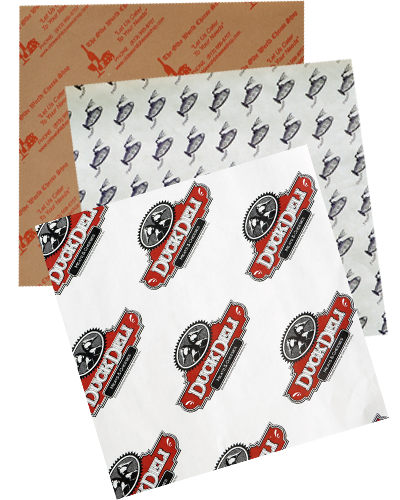 Then look no further than our custom printed Sandwich Paper. This coated, medium weight food service sheet is sure to exceed your highest expectations!